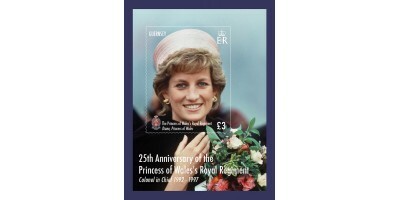 The Princess of Wales's Royal Regiment was named in honour of Diana, Princess of Wales, who was at the time of its formation the Colonel in Chief of the Regiment, a role she held from 1992-1997.The mi..
Stamps Descriptions:44p - Carol Service in Canterbury Cathedral59P - Colours Presentation60p - The Flying Tigers Parachute Display Team73p - Homecoming80p- Freedom Parade90p - Infantry ExerciseOur set..
A Limited Edition Imperforate Uncut Press Sheet. 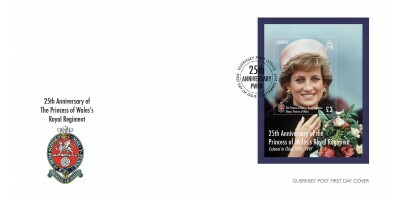 Only 500 are available, the sheet includes eight Princess Diana Miniature Sheets. .. 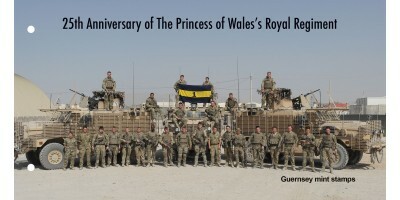 The Princess of Wales's Royal Regiment (PWRR), whose members are also known as The Tigers, was formed on the 9th September 1992 through the amalgamation of The Queen's Regiment and The Royal Hampshire Regiment. 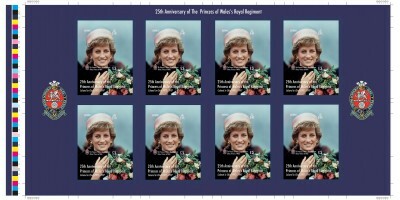 Named in honour of Diana, Princess of Wales, it acts as county regiment for the South-East of England, together with the Channel Islands and the Isle of Wight. The PWRR, which is made up of a Regimental Headquarters based at Her Majesty's Tower of London, three battalions and a Reserve company, is the senior English line infantry regiment of the British Army, part of the Queen's Division and second only in line infantry order or precedence to the Royal Regiment of Scotland. 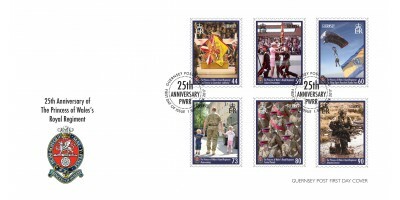 To mark the 25th anniversary of the formation of PWRR new Colours are being presented this year. 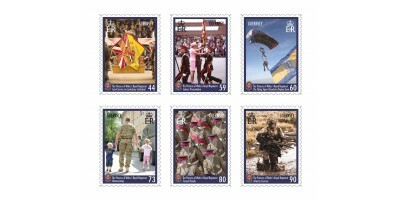 Modern Colours are made up of two standards: the Queen's Colour, which is based on the Union Jack and symbolises the Crown to which the soldier's loyalty is due; and the Regiment Colour, which for PWRR is yellow with the Regimental Cap Badge superimposed, representing the spirit and tradition of the Regiment. 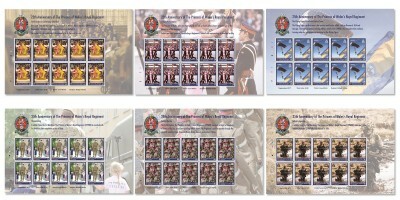 We are delighted to depict the Regiment across our stamps, which comprise members of the Flying Tigers Freefall Parachute Display Team; the annual carol service at Canterbury Cathedral where Regimental Colours are displayed; 3PWRR at a Freedom Parade; a 1WPRR soldier returning from a tour of duty; a soldier from 2PWRR training in the Falkland Islands; Diana, Princess of Wales, the Regiment's former Colonel in Chief, presenting new Colours to the Ensign on the formation of the Regiment.